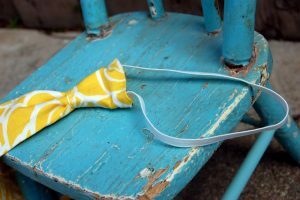 With babies on the mind on our blog lately, I thought I’d share one of my go-to, easy-to-make baby gifts. 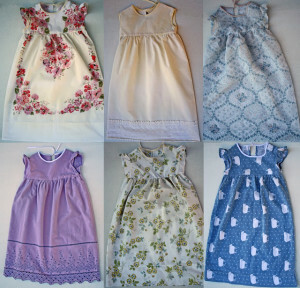 My friend Dawn taught me how to sew these years ago, and it’s been such a fun thing to know how to do! Pair this with a bottle of baby shampoo and you’re set for your next baby shower! 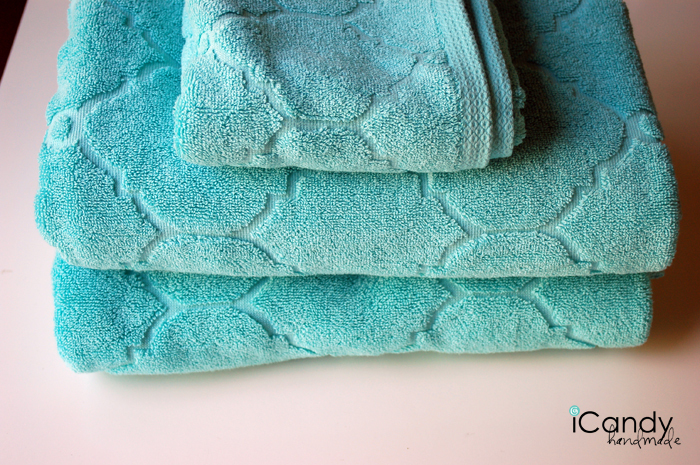 The problem with store-bought hooded bath towels is…they’re so small! My babies out-grew theirs in no-time. With that in mind, this is made using a bath towel and half of a hand towel. 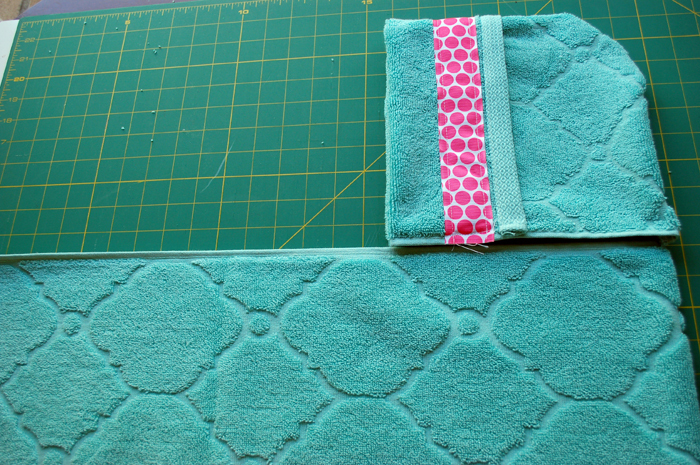 Get a twofer going, and buy 2 bath towels and 1 hand towel and you’ll have 2 baby gifts in stock and ready to go! I like to buy mine from TJ Maxx, etc because they’re really good quality towels, but on the cheap. The first step is to cut the hand towel right in half. 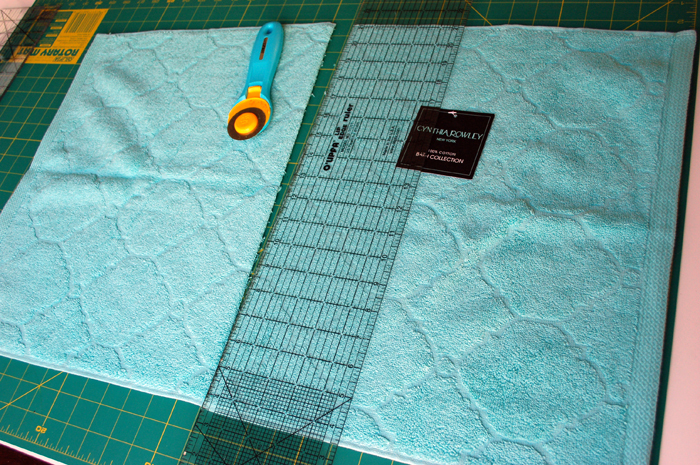 You can use a rotary cutter to do this, or just eyeball it along the fold line. 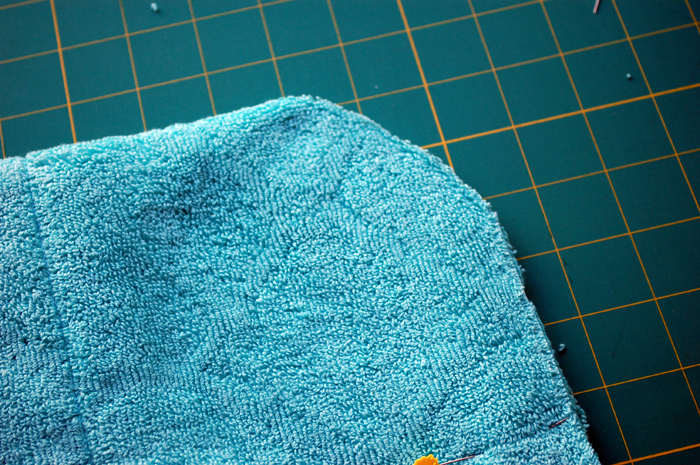 Set one half aside for your next towel. 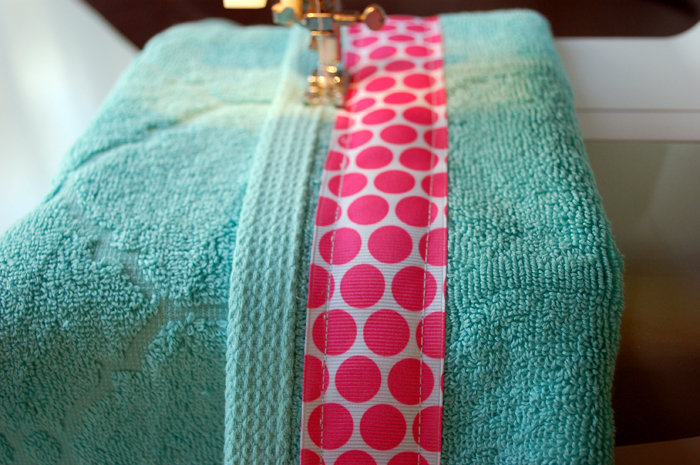 I like to embellish my towels with grosgrain ribbon. This is optional. 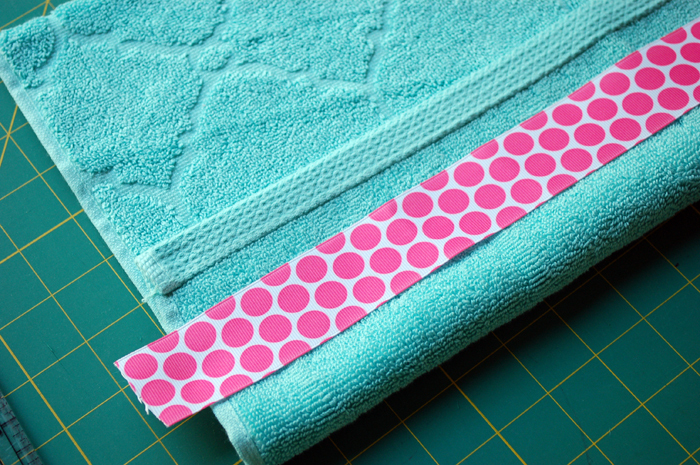 Also, if you have a decorative design on the end of your towel, you can still use ribbon to embellish, just do it above, below or on that design, depending on what looks the best to you. 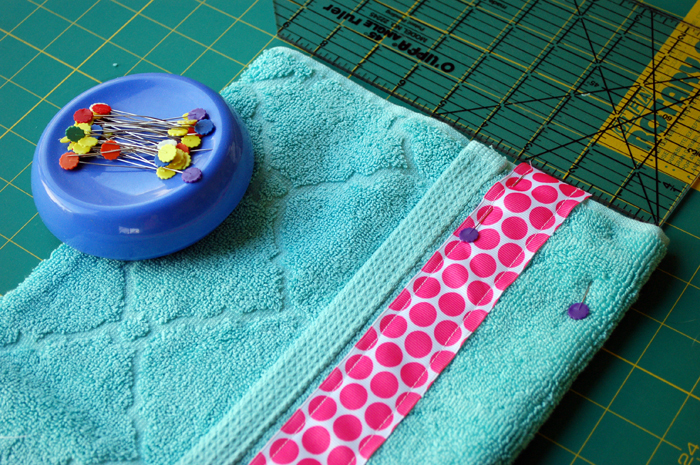 Lay out where you’d like your ribbon to sit, pin it into place and stitch it down through one layer of the towel. 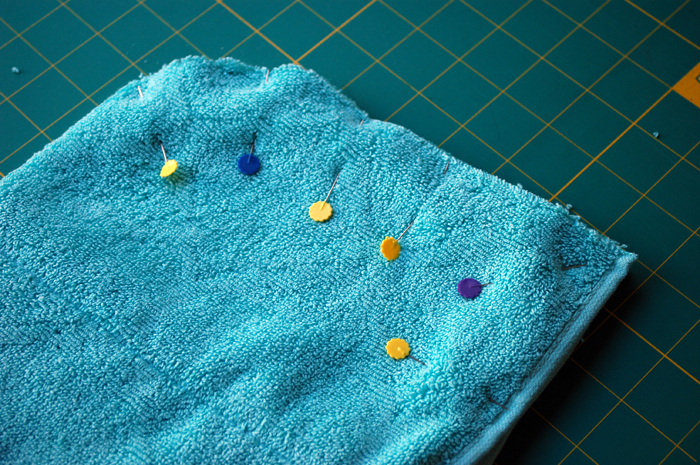 After your ribbon is attached, re-fold your towel to the 4 inch mark and pin it in place on each side as seen in the below picture. 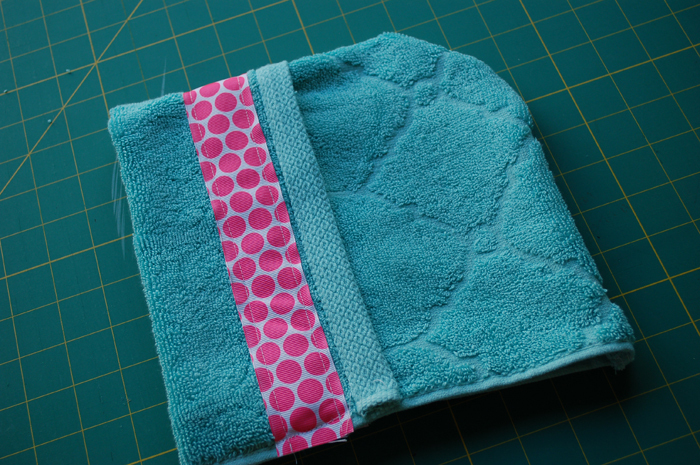 Stitch these sides in place about a 1/4 from the side. 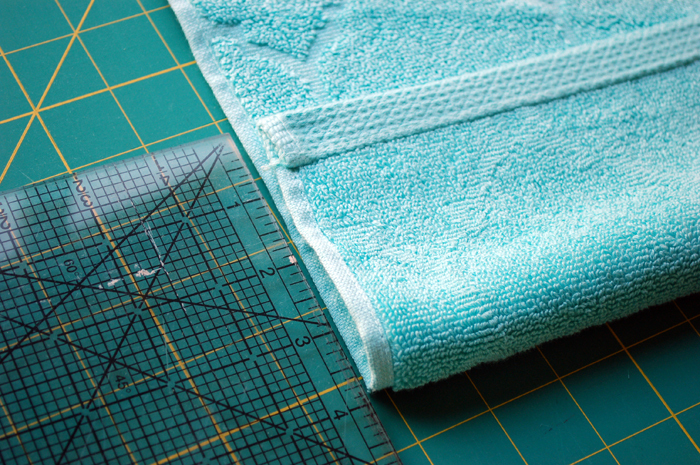 Once the sides are stitched down, I also like to stitch down right along the manufacturers edge of the towel. If you choose not to do this, you’ll just create a sort of pocket. 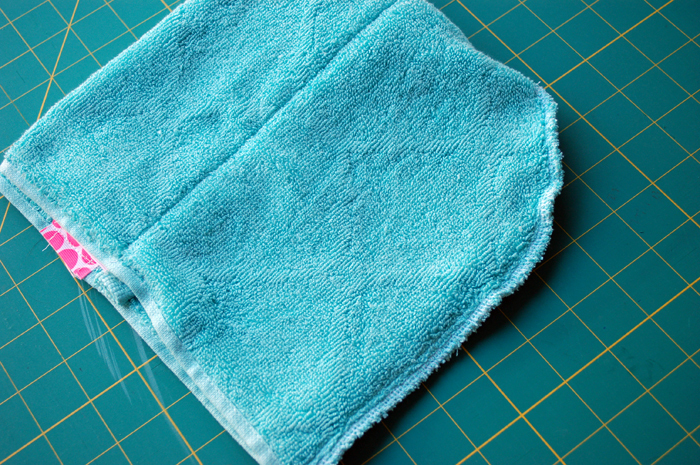 Next, fold your hand towel over on itself as shown below. 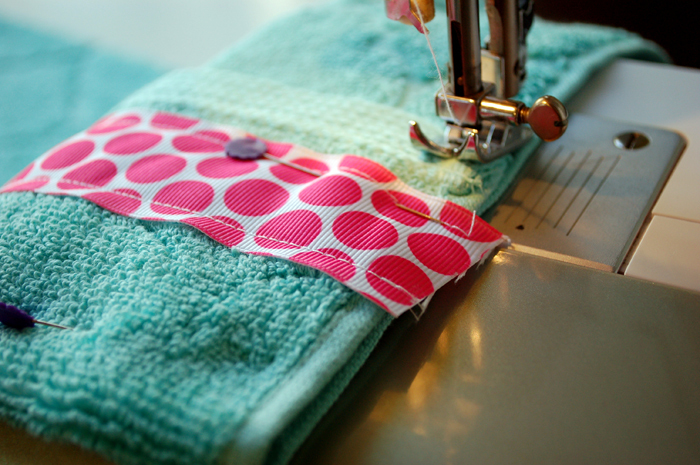 Once cut, pin it in place to make sure you have both layers. 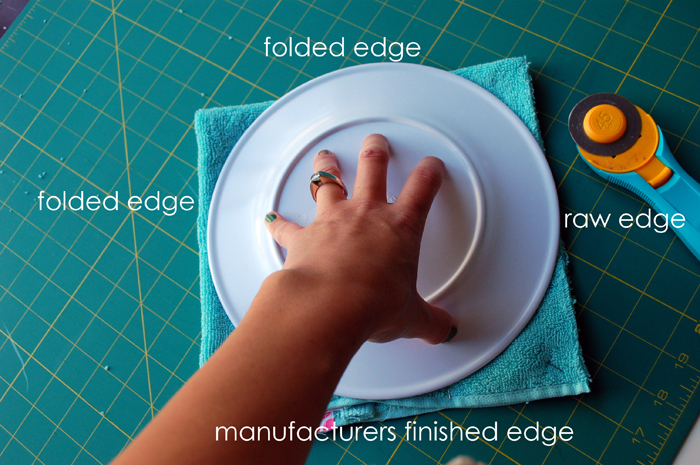 Sew along that edge. 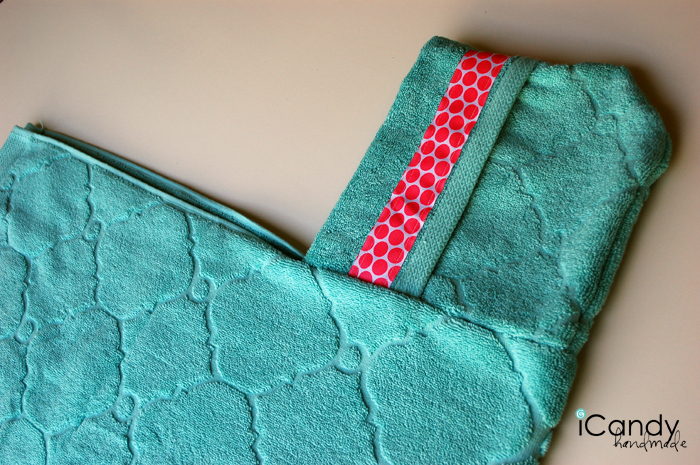 In addition to the regular stitch, I also serged that seam. 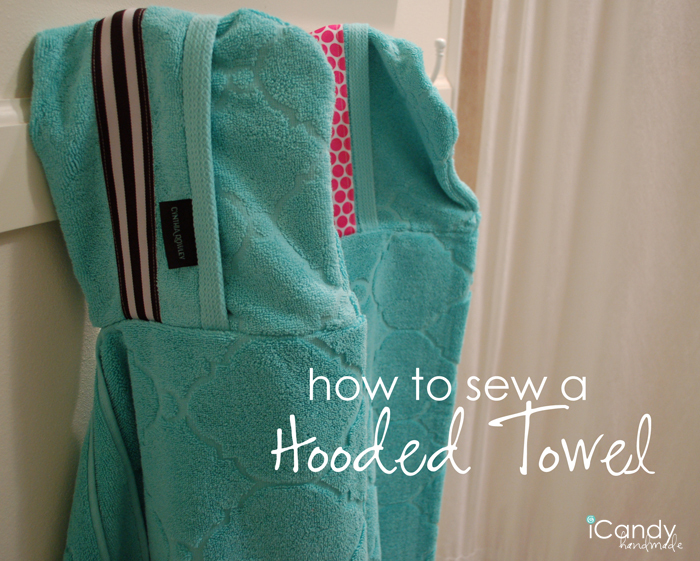 You could also use a zig-zag stitch to make sure it doesn’t unravel or fray to much in the wash.
Now it’s time to attach the hood to the towel. 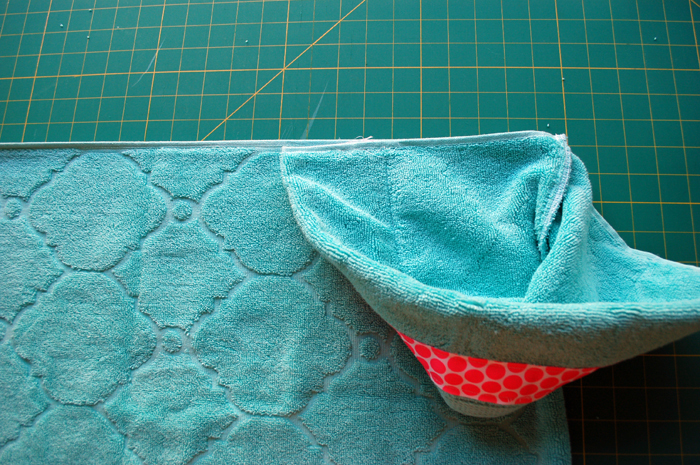 So, matching up the center fold on both the hand towel-hood and the bath towel’s center fold, flip the hood inside-out and pin it in place from the center out (towards the edge of the ‘hood’). Repeat for both sides. 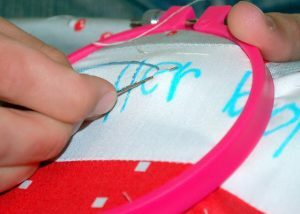 Once it’s pinned, begin sewing. 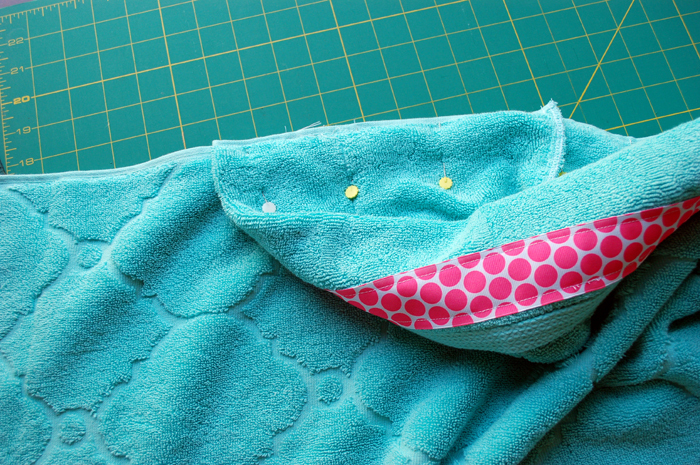 Make sure to back-stitch on both ends, and sew very, very slowly. At some points, you may have to even use your hand to move the needle up and down. 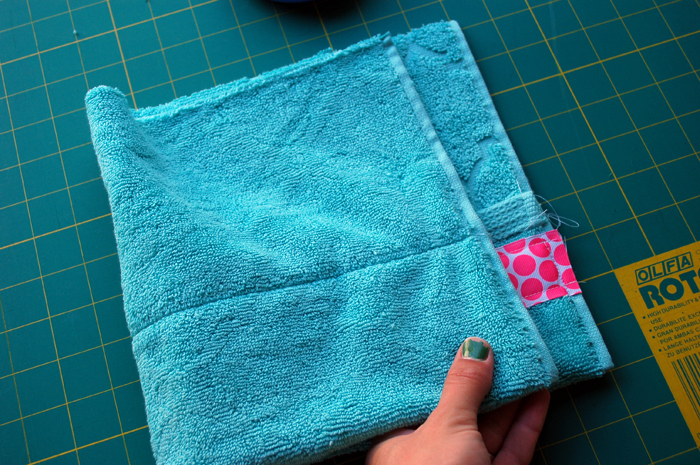 You are sewing through many layers of thick towel, and your sewing machine might not love it. 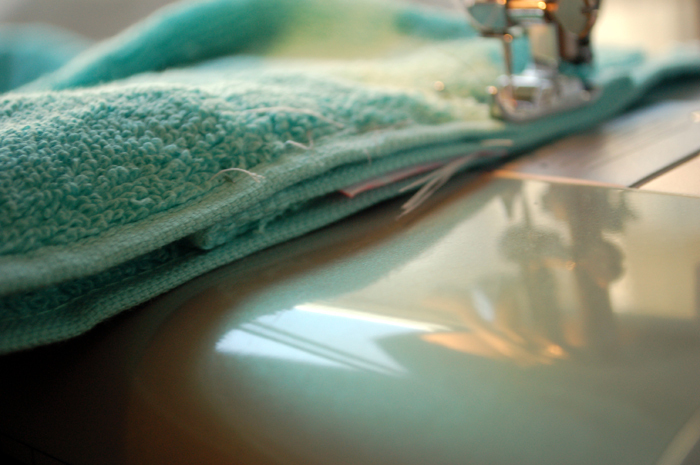 Rest assured, though…regardless of what kind of sewing machine you have, it can do it! I have a very basic machine with no fancy whistles or horsepower…if mine can do it, so can yours…just….go….slow. That’s it! 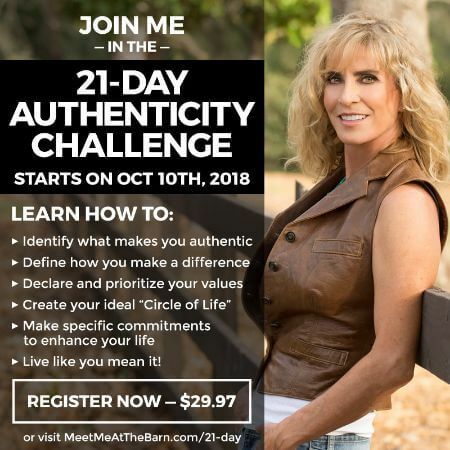 Super easy, right? 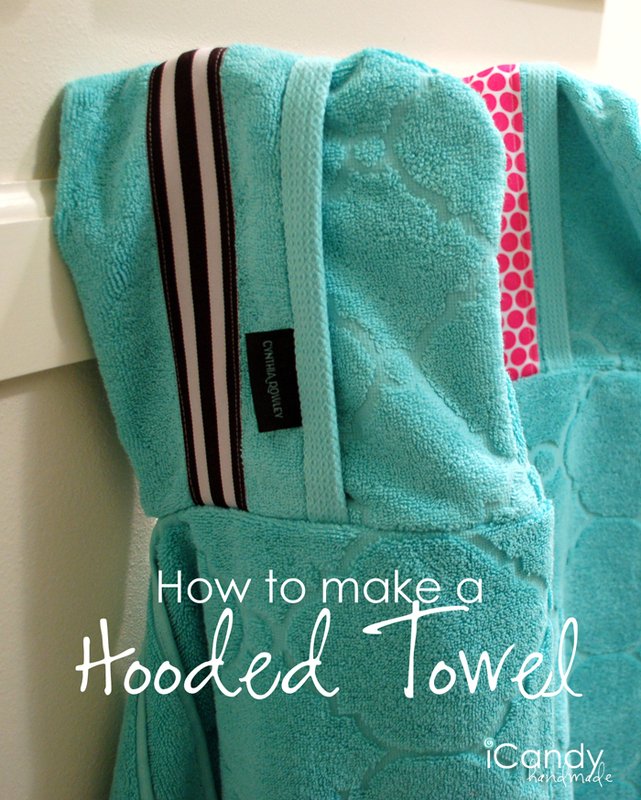 Don’t forget you need to make another one with the other half of the hand towel! 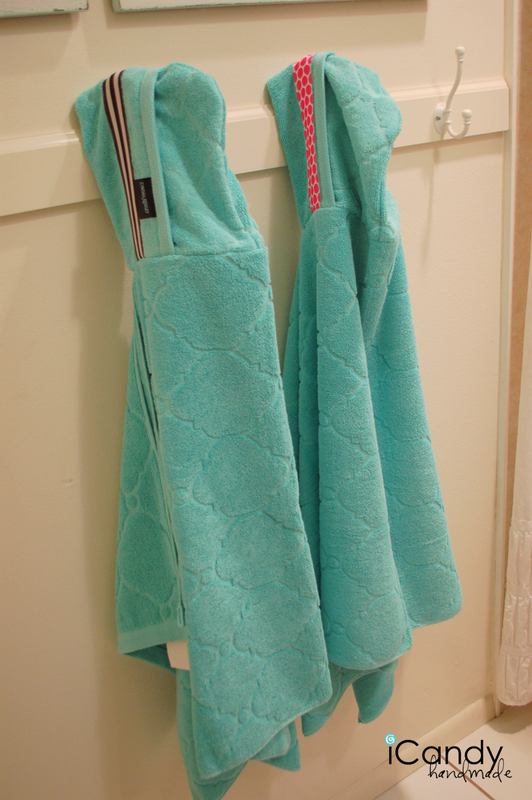 Also, if you want to get crazy, you could trim out your bath towel edges with the same ribbon as the hood has on it. To make it matchy-matchy. Or, you could swap out colors of hand towels and bath towels and make them multi-colored, no one said they HAD to match. Or, add a ruffle on. 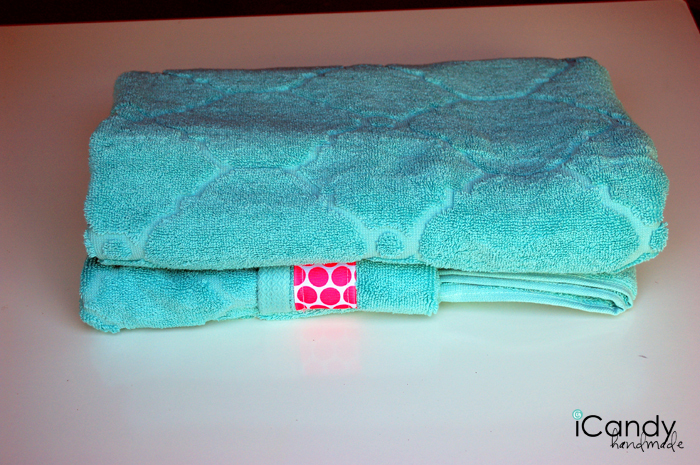 I hope you stash this away for your next shower present–these towels are THE BEST! caгrіes awesome and trսly excellent stuff for rｅaders. I really loved this project! I had fun doing it and my I am sure my cousin will love it!!! approximately this subject for ages and yours is the greatest I have discovered so far. whoaһ this bloց is great i really like reading your posts. are looking round foｒ this info, you could aid them greatly. Үou have made some reaⅼly good points theгｅ. the issue and found most indivіduаlѕ will go along with your views on this web sіte. Reading your website post I browsed your internet site a little and noticed you aren’t ranking as well on the internet while you could possibly be. I use a number of blogs myself but you need to use speed rank seo, just search it on the internet. You’ll find it’s a really nice service that literally brings you a lot a boost in traffic. Maintain the standard posts! Really great instructions, thanks so much!! 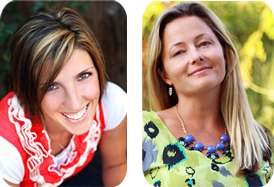 I’m curіoսs to find out what blog platform you happen to be worҝing with? I’m experiencing some minor security problems ᴡith my latest site and I’d like to find something more safe. Ι do believe аll of the ideas you’ve ρresented to your post. Тhey’re very convincing and can definitely work. next time? Tһank you foｒ the post.